There are dozens, maybe hundreds, of cleansers on the market for oily skin. Many have harsh additives that irritate or that strip your skin completely. When this happens your skin tries to recover by producing even more oil that can then make the issue worse. I have oily skin myself and when I was younger I tried anything and everything to clean it and treat my blemishes. These days I only use natural cleansers on my face and also try to cleanse less frequently. It has truly helped to even out my skin tone. When I’m not using this easy DIY soap-less cleanser, I’ll use one of my own soaps on my face. I generally use the latter during ‘that time of the month’ when my skin feels a bit more oily. 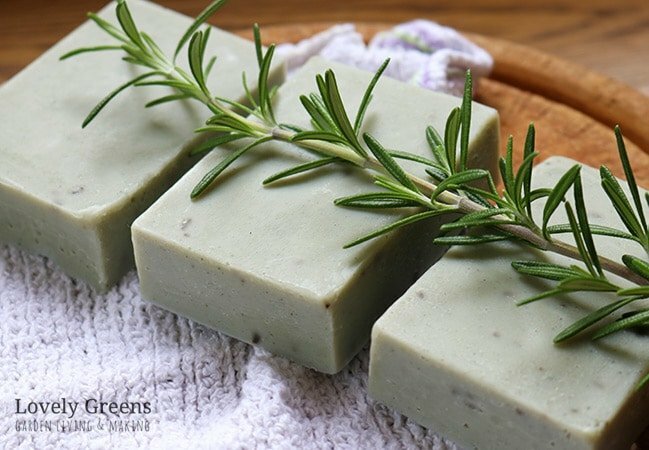 This is one of my soap recipes that includes anti-bacterial rosemary essential oil and cambrian blue clay for its oil drawing properties. The recipe includes all natural Vegan oils and I’ve made the recipe very easy to make for beginners. Interested in Naturally Colouring soap? You may have found this recipe through my piece on natural colours for handmade soap. There are so many wonderful natural ingredients that you can use to tint your batches but some have properties other than just a pretty colour. Cambrian Blue Clay is found as a natural element that is mined from areas in northwest Russia. Clay is used in beauty products for its oil pulling ability and you’ll know its use in face masks or in drawing salves. 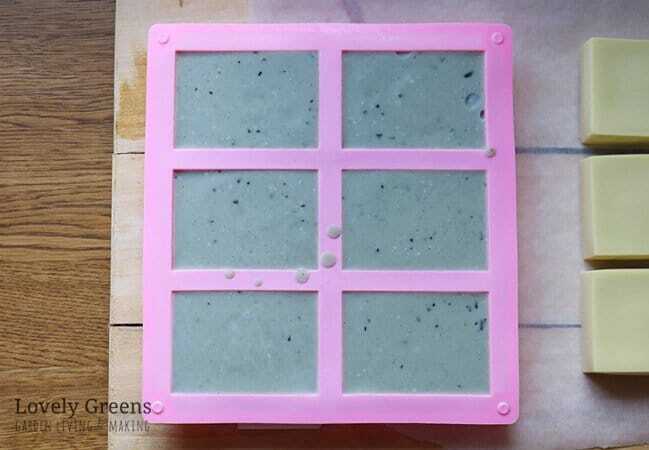 In soap its used for tinting but if the right enough is used then that clay can also work to cleanse oily skin. 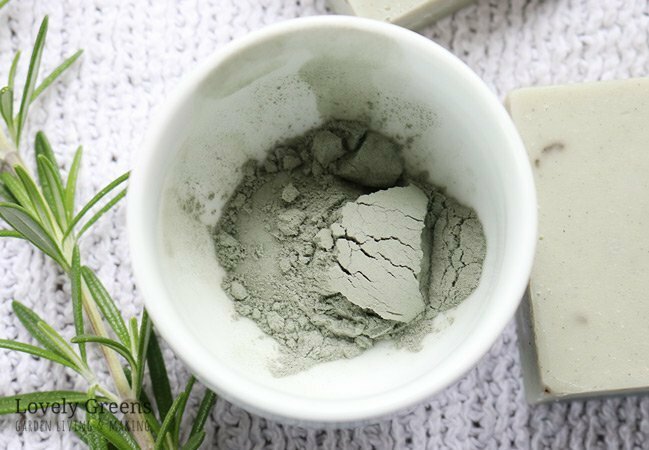 Blue clay’s colour comes from having a high content of chemically reduced iron and this has been linked to its ability to naturally eliminate bacteria. Bacteria causes pimples and blue clay is the perfect ingredient to use to gently treat blemishes and break-outs. 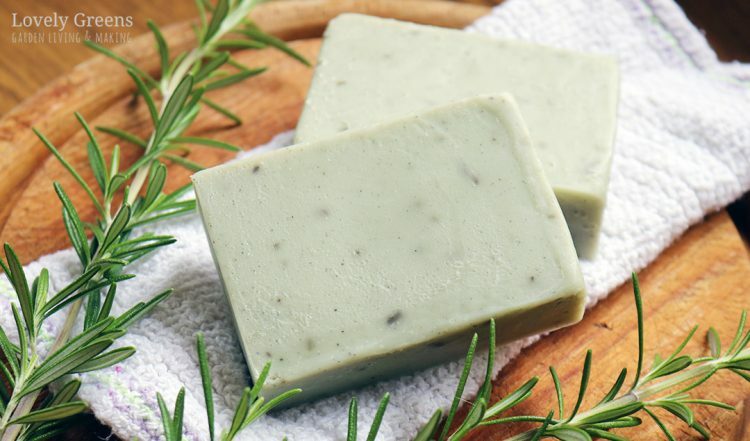 Like Blue Clay, rosemary oil also works to kill bacteria, fungi, and other microbes. Actually, it’s been observed to specifically kill Propionibacterium acnes, the bacteria that causes pimples. This makes it ideal in natural skincare for problematic skin in both its fresh plant form and in concentrated essential oil. 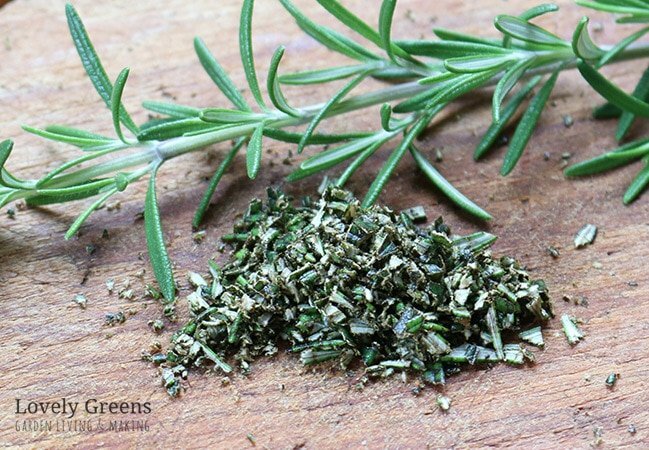 This recipe uses both, and the fresh rosemary can be grown in your own garden or purchased. Fresh rosemary has a very low water content and even in relatively large pieces I’ve never had an issue with it not preserving well in soap. When chopping the rosemary for this recipe I do recommend that you get it as fine as possible. It adds visual interest and potentially allows more of the rosemary extract to be released into the soap. Larger pieces can also be off-putting when you’re using the soap. I personally don’t like large chunks of dried leaves coming out of bars and ending up in the shower tray. Everyone is different though so if you’d prefer you could chop them a bit rougher. The full video instruction on making this soap is at the bottom of this piece. The recipe may be a little different from other cold-process soap recipes since it uses quite cool temperatures. In fact, this is a room-temperature soap making recipe. This technique helps to make the soap making process easier and also stops the soap from ‘Gelling’ or getting darker. If you use extra virgin olive oil in the recipe expect for your bars to come out a soft grey-green. If you’re using a lighter coloured olive oil pomace, the colour will be more blue. If you’re new to making natural handmade soap, you should read my four-part series on natural soap making. It gives a good introduction on what to expect from ingredients, equipment, cold-process soap recipes, and the soap making process. I’ve recently stepped into making room temperature soap and while it’s not ideal for all recipes, it works great for this one. We’re using a water discount of 33% to help speed up the trace and to also reduce the chance of the soap gelling. The temperature and water discount work together in this. A couple of hours before you make soap, pour the sodium hydroxide in the water and stir very well. You should do this in a well ventilated area and try not to breathe in the steam. It will be over 200 degrees at this point so be careful. Set the jug someplace safe and leave the lye mixture to cool to room temperature. 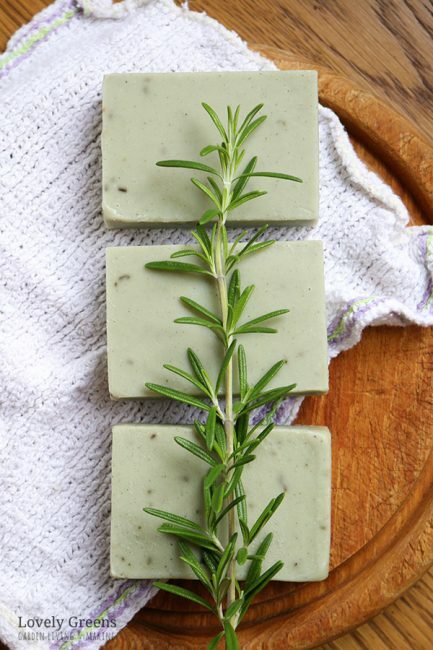 Just before you’re about to make your soap, chop the rosemary and mix the clay together with water. Though the video in this piece shows adding this to the soap after Trace, it’s actually easier to add it to the cooled lye water. It really helps with dispersing the clay. If you’re using the optional Sodium lactate, add it to the lye water once it’s cooled too. Sodium lactate helps harden bars quicker and this can be handy for soaps that have a lot of olive oil, like this one. When the lye water has cooled, melt the solid oils on the stove. When they’re just melted, remove the pan from the heat and pour the liquid oils in the pan. Stir well and cool the oils until they’re about 27 °C (80 °F). Floating the pan in cool water whilst stirring helps. While it’s cooling, add the clay-water to the pan and stir. Adding the clay before stick blending helps the clay to disperse better. It also helps cool the oil temperature down a little. When cooled, pour the lye water through a mini strainer and into your pan. Use the stick blending technique shown in the video below and blend until you reach a light trace. Stir in the essential oil then the rosemary and pour into your mould. It may be a grey colour at this time but it will change. Leave the soap to harden up inside the mould for 48 hours before taking it out. It may be a little sticky when removing, especially if you decide not to use Sodium lactate. In this case, you can leave the soap in the mold for longer, even a week or more. You can also put the entire mold in the freezer for 30 minutes to an hour. They should pop out easily after that. Cure the soap for four weeks before using it. The lather is stable and creamy and the colour of the soap will be grey-green to grey-blue depending on the quality and colour of your olive oil. There’s a clip of the lather in the video below. Thank you so much for your video tutorial and wonderful recipe! Smal batches are so helpful as I am just making soap for myself (and I guess giving to my friends and family!) I am just getting into soap making and excited to try this one! hi Tanya, thanks for sharing your wonderful soap recipes. Thinking of making some for commercial purposes. but i am in Africa and its quite difficult getting fresh rosemary. I was wondering if i could use dried rosemary instead and if possible how do i use it. Hi Lorraine and yes, you can used dried rosemary. Chop it up finely and only use half the amount of fresh. Thank you again for sharing another great soap recipe! I made a batch a month ago and am now happily using them. They smell wonderful, feel great and have lots of fluffy lather. I will be making these again soon. Mine turned out a pale greenish grey color. So glad I discovered your website! So pleased to hear it 🙂 Doesn’t the rosemary essential oil smell amazing? I was always told making soap was dangerous. Your video for the lavender soap was wonderful and “scrubbed” my fear of making my on soap. Thank you so much! I have a question..Will the rosemary turn brown in and on the soap? Thanks! I love these! They are lovely! Yes it will and in the photos you can see how it’s turned brown already. Each little piece of lavender creates a dark speckle in the soap. I think that i’s a pretty effect contrasted against the blue-green of the bar.